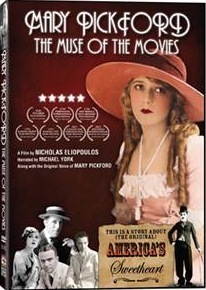 Win a Copy of "Mary Pickford: The Muse of the Movies"
Want to win a copy of Nicholas Eliopoulos' new documentary, Mary Pickford: The Muse of the Movies, courtesy of Cinema Libre? All you have to do is head over to my Twitter page and retweet this message. Three winners will be chosen and announced on June 19. Winners must be residents of the United States to be eligible. Mary Pickford, The Muse of the Movies traces the life and work of this legendary silent film star, movie pioneer, and keen businesswoman. Pickford’s life (1892-1979) also parallels an even larger story, telling of the “birth of the cinema” itself. Pickford co-created United Artists' Studios, spearheaded the founding of the Academy of Motion Picture Arts and Sciences, as well as established the Motion Picture Retirement Home. Mary, known as “America’s Sweetheart,” was the first actress to earn one million dollars, and only star ever to receive a 50 percent profit share of her movies. She was the first actor, male or female, to have her name placed on the Cinema’s marquee along with the film’s title, and she was the first to win an Oscar for Best Actress in a “sound” motion picture for her performance in the 1929 film Coquette. In 1976, Mary was presented with her second Academy Award for her humanitarian work. In this documentary, through restored vintage audio recordings, Pickford narrates her own story along with actor Michael York. Classic film clips, rare home movies, and cameo interviews with Adolph Zukor (founder of Paramount Studios), famed aviator Amelia Earhart, Douglas Fairbanks, Jr., Lillian Gish, Buddy Rogers (Pickford’s last husband), as well as the only interview ever given by Pickford’s daughter, Roxanne Rogers Monroe, give the viewer an in-depth look into the early world of the American cinema. Special features include a Q&A with director Nicholas Eliopoulos at the Toronto International Film Festival, director interview on NPR’s “On Film," and over 30 archived images of Mary Pickford. A must have for all cinema history buffs and silent film fans, the DVD will be released on June 19 from Cinema Libre.